As a member of Romance Writers of America, I like to support the individual chapters who accept digital-first and digital-only books in their published author contests. 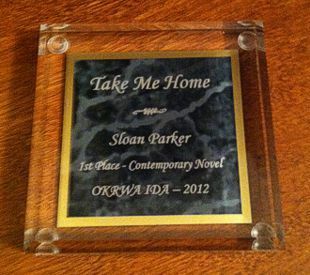 Earlier this year, I entered Take Me Home in the Oklahoma RWA’s International Digital Awards. It won first place in the Contemporary Novel category, and I recently received this awesome plaque in the mail. Huge thanks to the contest coordinators and judges for their time and efforts in running and judging such a professional contest, their tweets and other mentions of my book’s win, and for the beautiful personalized award. I love it! This entry was posted in Photos & Imagery, Sloan's Writing, Writing Contests & Awards and tagged friday photo, Oklahoma RWA's International Digital Awards, romance writers of america, sloan parker's books, take me home by SloanParker. Bookmark the permalink. Whoohoo!! A plaque is way cool. I picture your fireplace mantel lined with plaques. Congrats. Thanks, Shay and Sadonna! Was really nice of the chapter to offer such a gorgeous plaque to the winners. Shay, you’ll have to enter one of your titles in 2013. A very well run contest. Congratulations Sloan! This is wonderful news.